Fashioning Faith takes a behind the scenes look at the emerging world of Islamic fashion and US-based clothing designers who make it possible. The film interweaves interviews and verité footage from a diverse array of Muslim women with one goal in common – to express their faith through fashion. 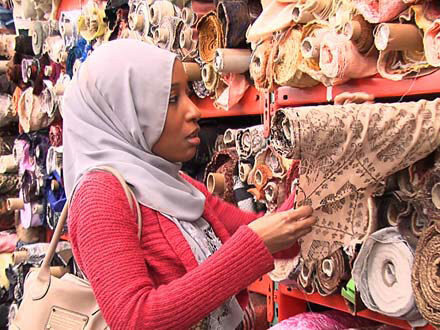 Nzinga Knight is a young Brooklynite who has won fashion accolades for her modest evening dresses – a first for the Islamic style market in America. Jenneh Williams has been in the Islamic retail business for decades, recently opening up her own boutique in Queens that caters to the growing number of black converts to Islam. Sabrina Enayatulla is a blogger fashionista with a mission – to change negative stereotypes of Islam through stylish creations. Brooke Samad hopes that her pious clothing collection will hit home with young professional Muslims looking for new alternatives to traditional garb, while the designers of the Eva Khurshid label seek to attract all Americans — regardless of creed — to their stylish clothing by making modesty the new mainstream.